Welcome to Zoom Investment Portfolio Manager! (but please donate if you find it useful). 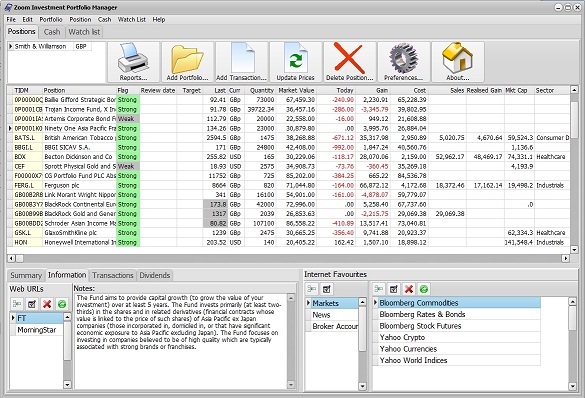 "... a simple and convenient way to keep track of your quoted Stocks and Shares investments." Stock prices are obtained from Yahoo and a valuation of your portfolios calculated. Cash Accounting in simple or detailed options as you wish. The current version runs on Microsoft Windows only (or using Wine on Linux) however future versions are planned to support Apple Mac and afterwards iOS and Android. Written in Delphi. Source code available for download.